Isaiah B Brunt, a former Darling Harbour studios owner operator had a successful career in the studio business, with the privilege to meet and work with major Australian artist’s and bands during his time behind the console. Working with the cream of the crop of Australian popular bands of the 80’s and 90’s and projects with Midnight Oil’s Rob Hirst, Cold Chisel’s Steve Prestwich, Rick Brewster of the Angels are just a few to mention including international movie star Keanu Reeves while filming the Matrix in Sydney. All the while Isaiah’s passion for the blues was always simmering in the background he was reignited with his love for the blues when he dusted off his father’s 1950’s custom lap steel guitar. In 2005 Isaiah started writing original songs and working at creating his own sound, 2010 saw Isaiah become the Sydney Blues Society performer of the year, representing Sydney as the opening act for the International Blues Showcase in Memphis in 2011 appearing on the Memphis Daily news. 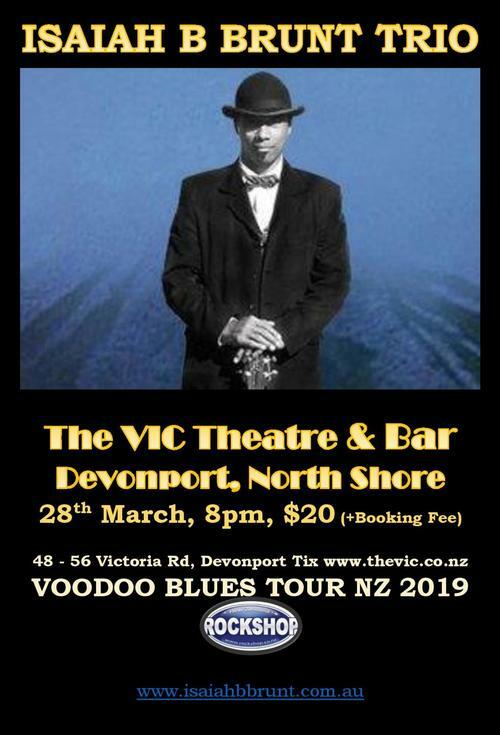 No#1 Australasian Blues artist in the North America’s Blues Underground scene alongside Buddy Guy (US) and John Mayall (UK). Award winning Blues Artist Isaiah B Brunt’s first album releases were initially acoustic recordings, they were followed up in 2015 and then 2016 with recordings done in the USA at the Jazzology label studios in New Orleans. The show consists of enthralling acoustic renditions and electric versions of those recordings including some very unique arrangements of some well-known standards and new original material. Bassist: Dave Quin a young bassist having studied Jazz at the Sydney Conservatorium of music performing with veterans such as Dale Barlow, Dave Panichi, Warwick Adler, Dave has acquired a affinity and love for both Blues & Jazz. Drummer & Percussionist: D Bruce Aitken originally from Invercargill and part of the Southland Music Hall of Fame spent time in Canada running a major drum festival on Bespoke and performing with award winning Internationally Renowned Canadian Blues artist’s.